I know you glanced at the image, but did you really look it over? Did you see the lantern? How about the hand truck or the barrel ramp or the slate roof? Did you notice the structure has a two-tone paint scheme? That paint looks fresh, doesn’t it? Each of the photos on today’s blog post has been slightly tweaked in Photoshop. A link has been provided in each caption so you can review the originals. 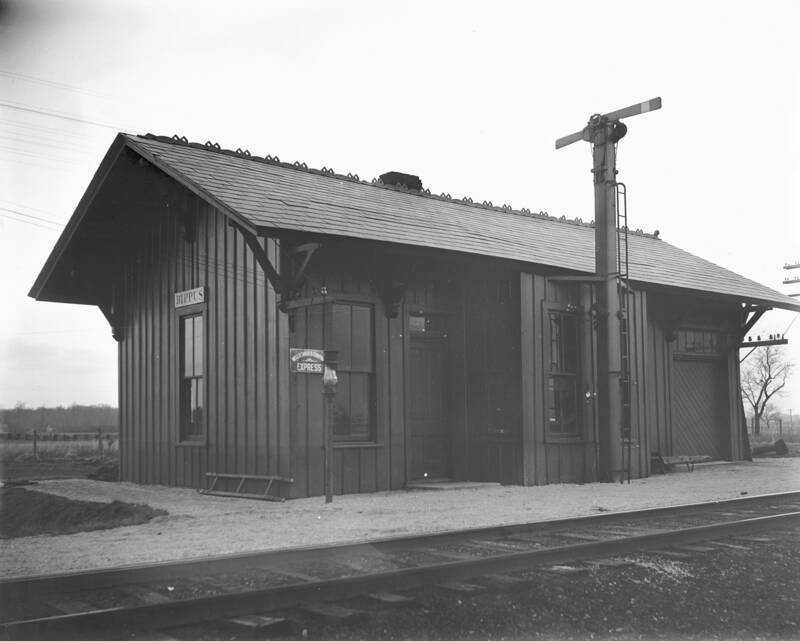 Erie Railroad company photo, Steamtown NPS, Image #A-418. The original image can be accessed through this link. 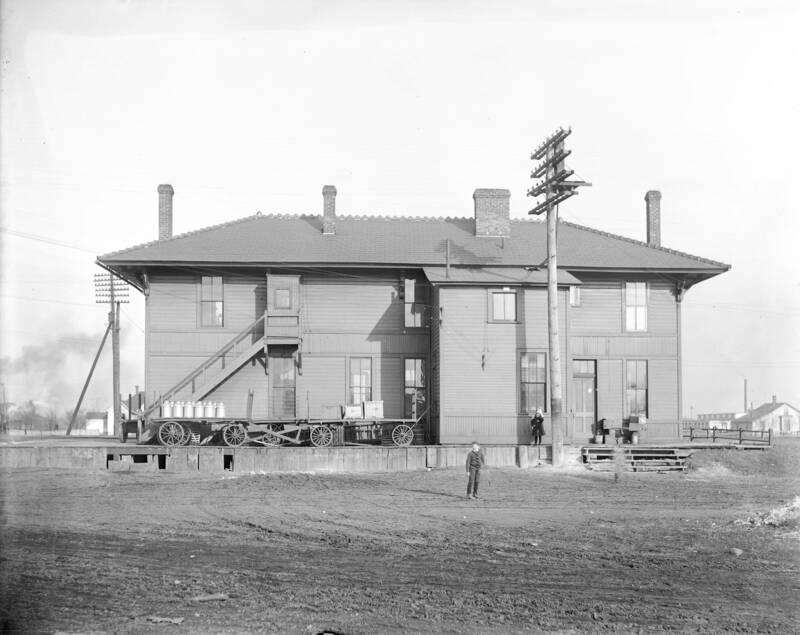 Here’s a look at the back of the Bippus depot. 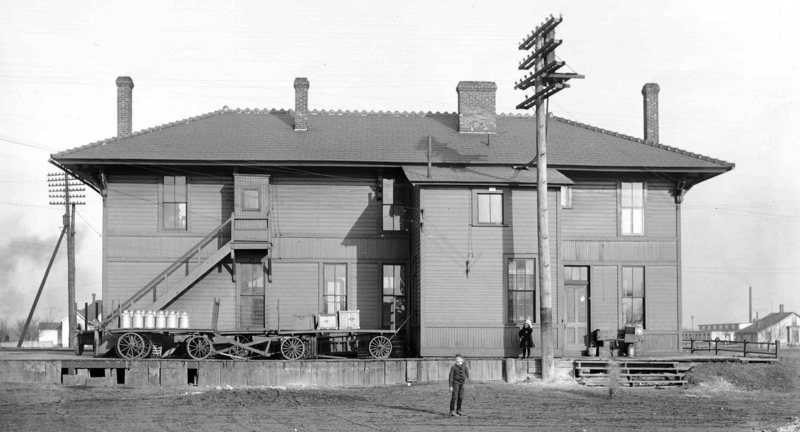 Baggage carts are frequently seen at depots in these Erie images, same with a ladder hanging on a side or back wall. What do you think the post is for on the right, just off of the back entry? Could it be a hitching post for a horse? 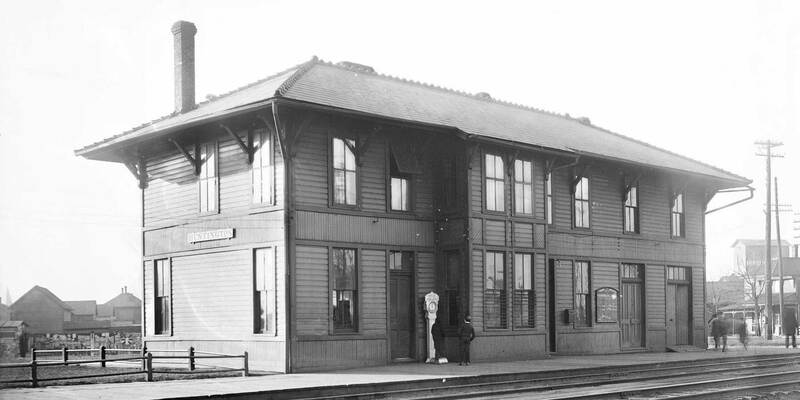 These images of the Bippus depot were taken in 1909, so horses would be an important from of local transportation. Erie Railroad company photo, Steamtown NPS, Image #A-413. The original image can be accessed through this link. 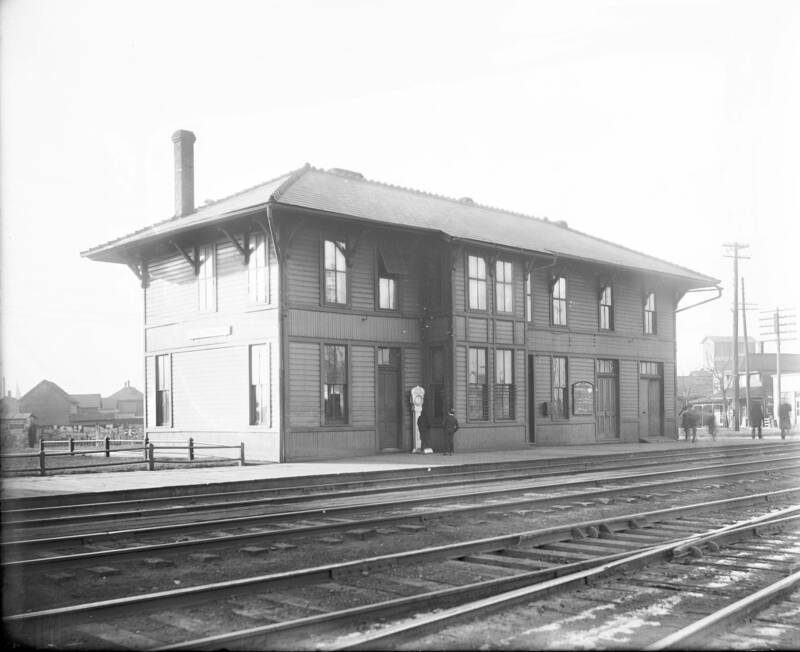 In reviewing these Erie depot images, I find few that look the same. Of course, the size of the local population would dictate the structure size and design. 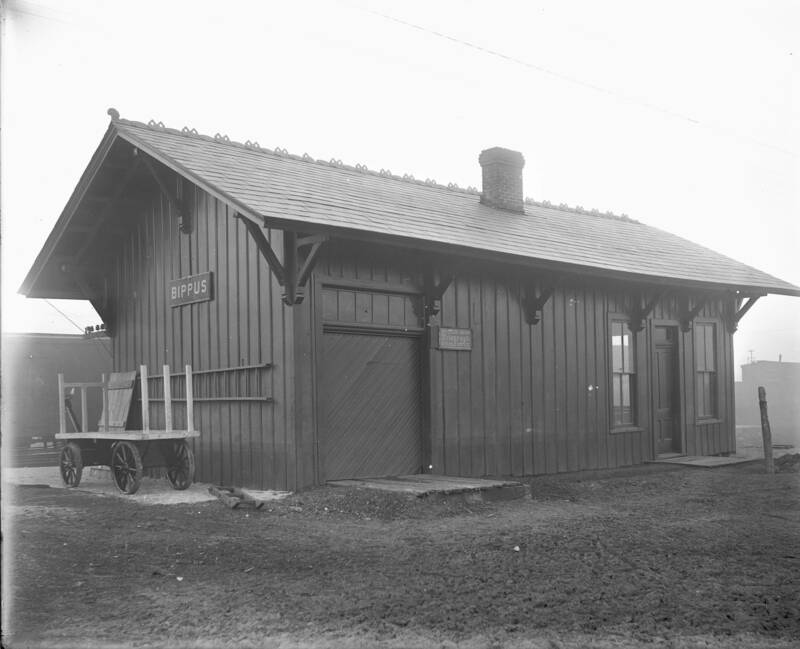 Huntington, Indiana was a larger town and the Erie had some offices in the depot. The penny scales show up quite a bit at the larger depots. A look at the background to the left shows an odd collection of something. Could it be a fence made of old signs? Erie Railroad company photo, Steamtown NPS, Image #A-414. The original image can be accessed through this link. The backside of the Huntington depot shows where the baggage carts are stored. There are several items awaiting pick up from this back dock. Milk cans and trunks are most noticeable on the baggage carts, but a look to the right shows several smaller parcels. Peek beyond the baggage carts and there are ladders hanging against the wall. 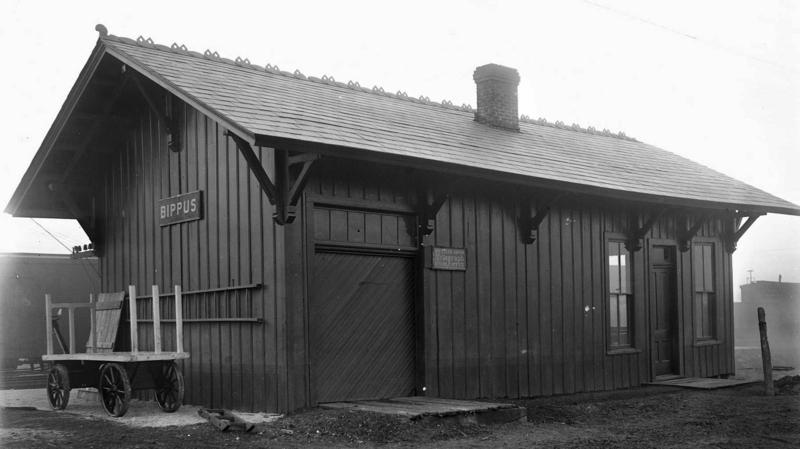 It looks like this structure has electrical service, while the Bippus depot only seemed to have a telegraph connection. DL&W company photo, Steamtown NPS, Image #X1354. The original image can be accessed through this link. Many of the photos document improvements and upgrades to DL&W facilities. I am a certified freight car nut and the image above has a few billboard refrigerator cars seen on the left. Models of these have been very popular in the hobby, but I’ve seen few cars in prototype photographs of the Teens and Twenties. The car sides are painted a light color with a contrasting color for lettering. Film of the time did not capture some colors very well much less the contrast between colors, such as yellow and red. We can barely see some letters on a couple of these reefers. 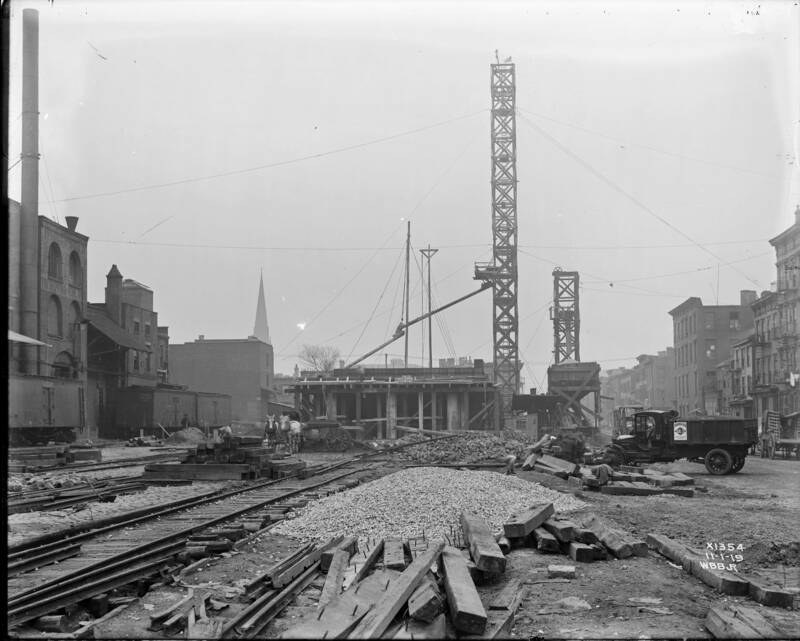 The construction image was taken in 1919 in what is now hipsterville, the Williamsburg section of Brooklyn, NY. Old vehicles show up quite a bit as well. DL&W company photo, Steamtown NPS, Image #A1427. The original image can be accessed through this link. 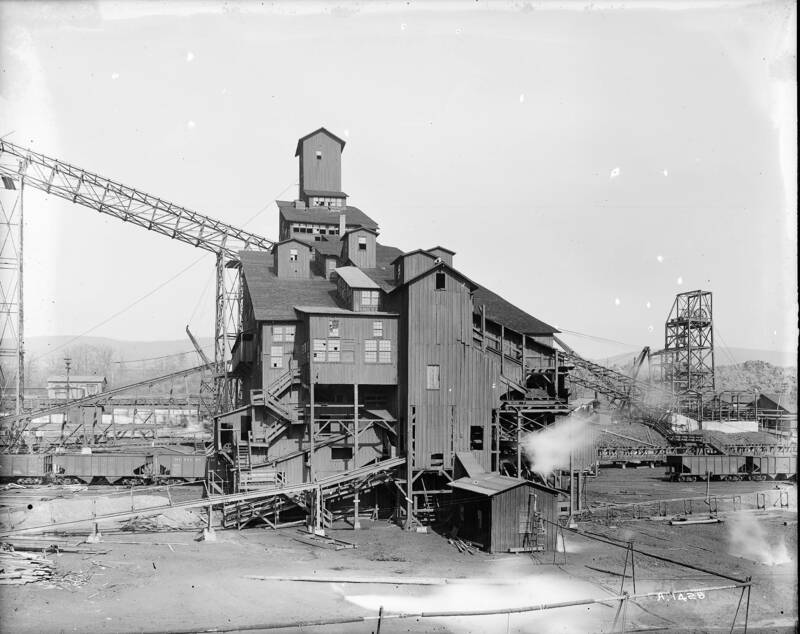 The DL&W was a railroad and a coal company. 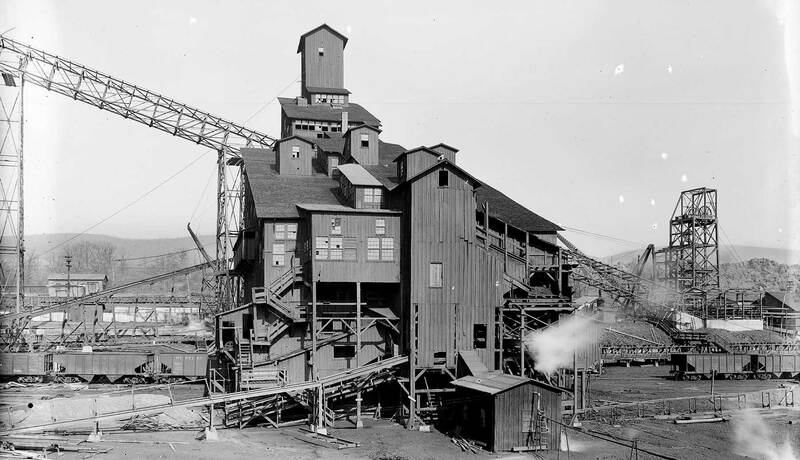 Nearly 100 years ago, they were upgrading their operations for more efficient processing. Steel is also replacing earlier wood construction. 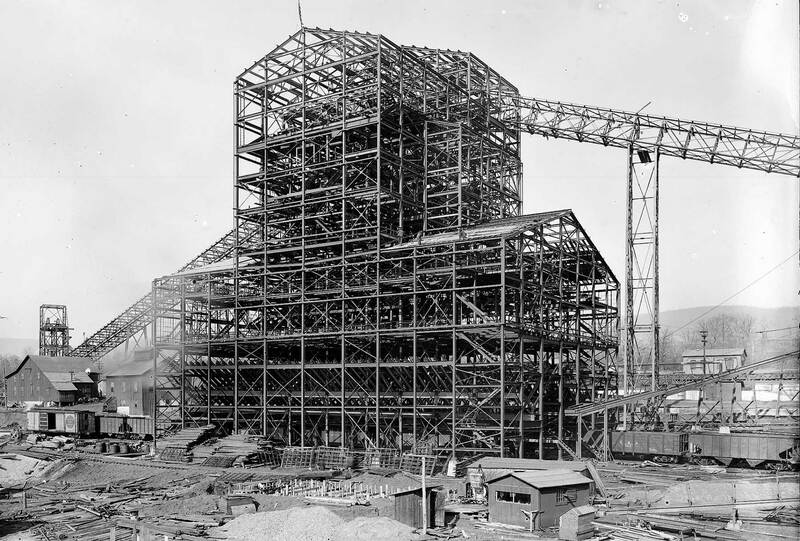 Just look at the massive Woodward Breaker framework, circa 1919. 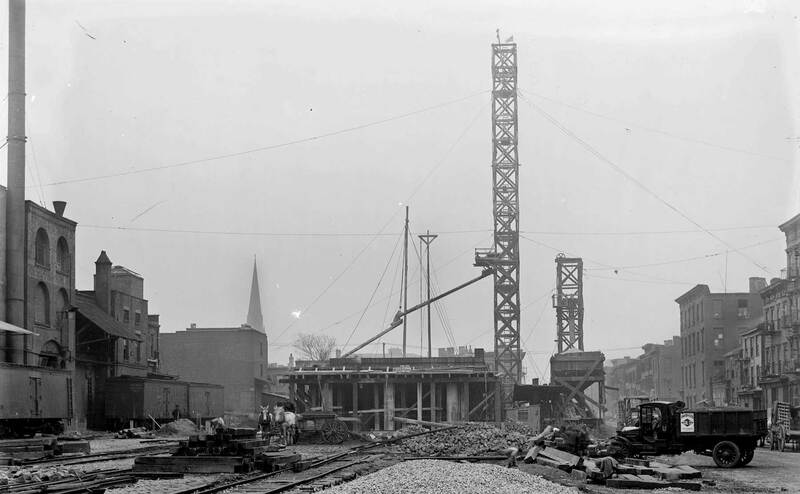 There were no large cranes back then. As the building went up, it became the base for temporary mounting of various booms to hoist more parts into place. The freight cars are winners, too. I don’t know why a string of cars is spotted at a complex that is not yet online, but there are some great coal haulers in the image. The Delaware & Hudson Seley design wood sheathed hopper to the right of the complex sports an odd sans-serif lettering style. Beside it is a Standard Steel Car Company design hopper that was common before the 1930s on the Erie, DL&W, W&LE, and other roads. This Erie car is one of a 6000 hopper order in 1906. At the far left, an Atlantic Coast Line ventilated box car has delivered material or hardware for the project. DL&W company photo, Steamtown NPS, Image #A1428. The original image can be accessed through this link. 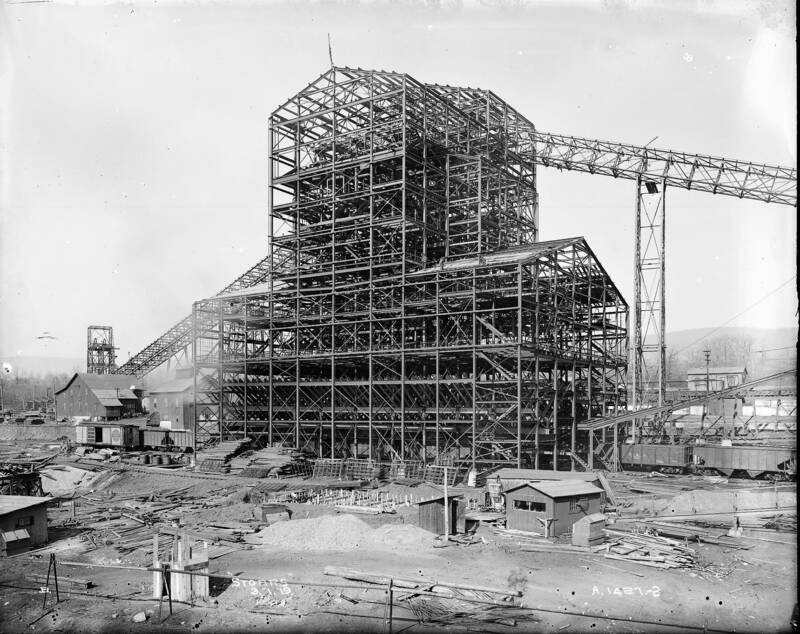 As a contrast to the steel framework of the Woodward Breaker, here’s a look at the old Storr’s Breaker. A new facility is being built off to the left, as you can see the angled conveyor framework headed in that direction. As the Erie hopper is the same as the one in the last image, I wonder if the Woodward Breaker was replacing this older Storrs Breaker. Interesting freight car finds can be seen on the right side of the structure. A Cambria & Indiana hopper is wearing a lettering style I’ve never seen. To the right of the C&I hopper is another odd car with funky, heavier side stakes. I’ve seen this prototype before, but I can’t put my thumb on the railroad. 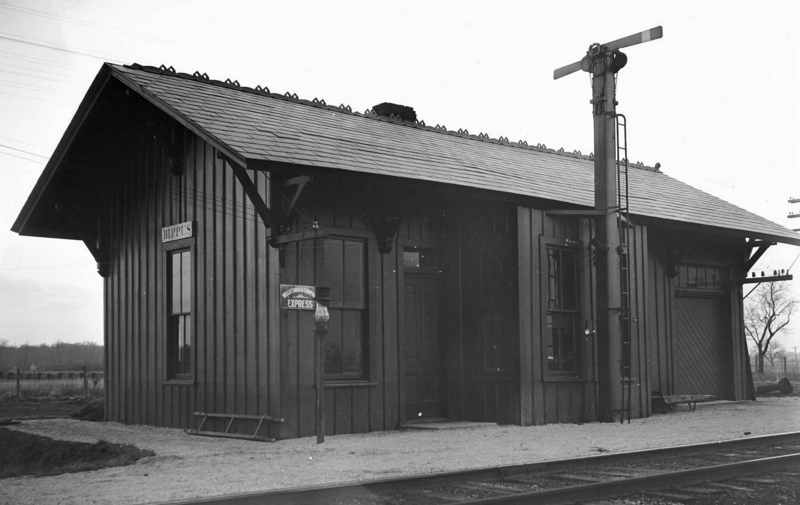 A Western Maryland hopper is spotted on the left side of the structure, far from home rails. These images are a great window into the past and offer lots of Pre-Depression Era modeling inspiration. Here are links for you to start looking. The images are not tagged so enjoy the journey into the archive. Many photos have been discussed via an email list. A search through the list archives might unearth more details on specific photographs. Thanks for dropping by and reading the blog. Share a comment in the section below. Please follow the instructions so your comment can be posted. All comments are reviewed and approved before they appear. To subscribe to this blog, enter your info for a comment and check the last box to notify of new posts by email. And by all means, please share the blog link with other model railroaders. In an enlarged image of the Woodward breaker steel frame work what appears to be an ACL ventilated boxcar is to the left of the breaker. Next Next post: Fresh Paint!